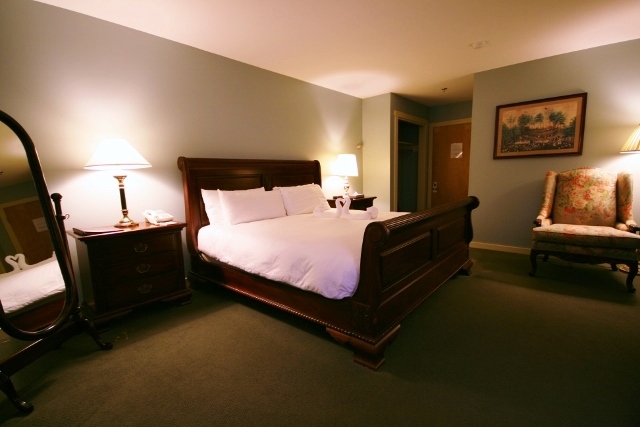 With your stay at The Stowe Inn, you will find a variety of rooms to fit your personal needs, as well as multiple accommodations including a living room with fireplace, a library with books and games, a tavern and bar, and an in-ground pool outside for your family to enjoy in the summer. 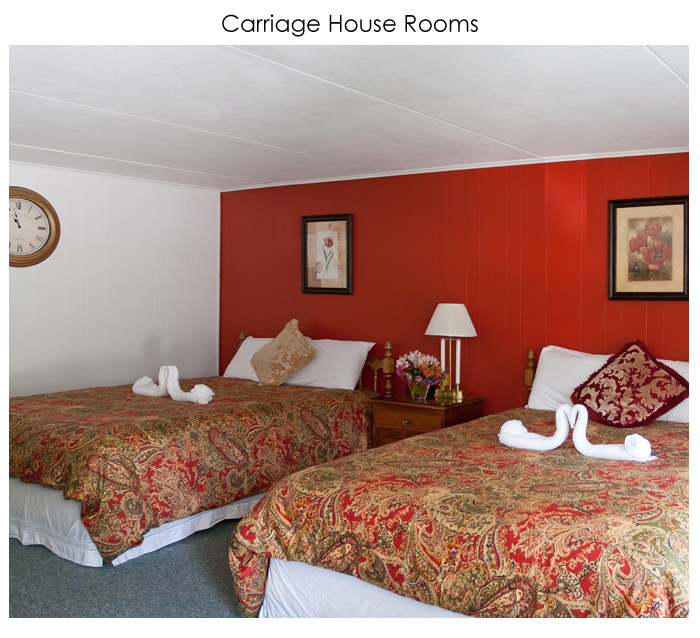 The Carriage House offers country lodge style rooms and suite. Each offers a private bath, and cable TV. Rooms are decorated with country quilts, and have armoires and some have pull out sofa beds. Find the room or suite that will best accommodate your stay below. 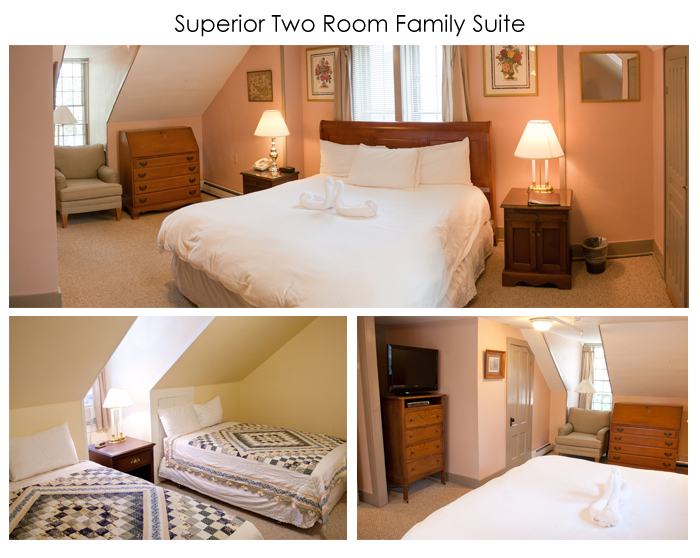 The Superior Two Room Family Suite features a historic spacious room with a King Size bed and bathroom, and an additional separate room with 2 double beds and separate bathroom. Perfect for families and privacy. • Prices are based on double occupancy. • Fees for additional persons apply. Elegantly decorated with fine wood furnishings, and down comforters, these rooms provide the full experience in comfort for any visitor. 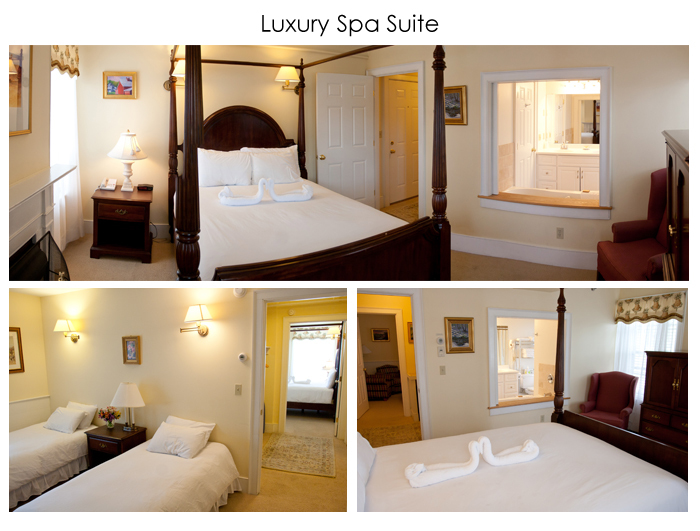 Full private bath and cable TV’s are included in each room. • If you reserve online, the room pictured may not be the one reserved. • Please contact us directly for special room requests. 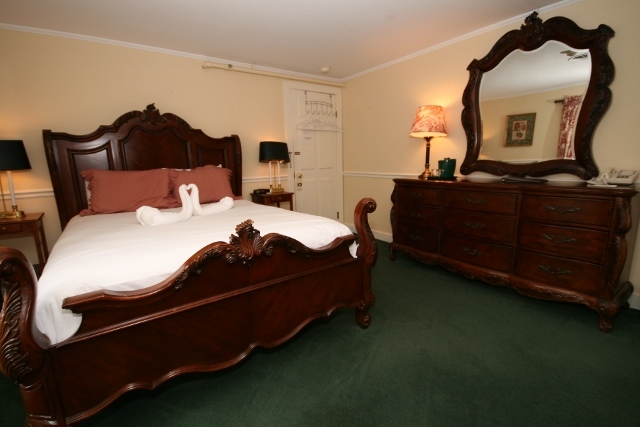 Elegantly decorated with fine wood furnishings, panel, poster or sleigh beds and down comforters, these rooms provide the full experience in comfort for any visitor. Full private bath and cable TV’s are included in each room. 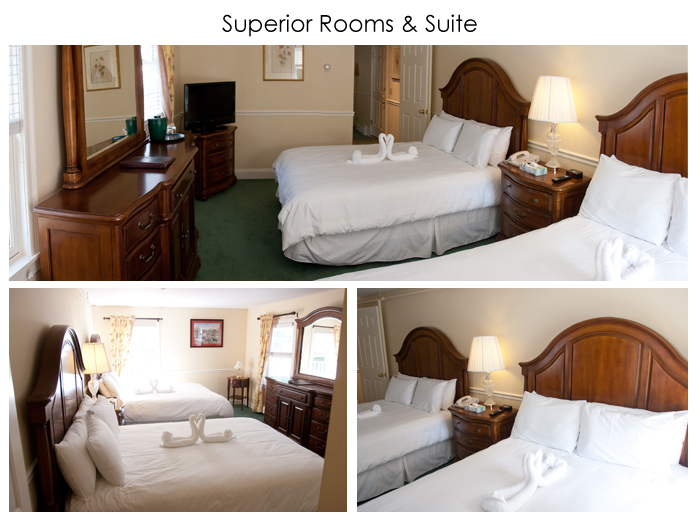 The Superior Rooms feature 2 queen size beds as well as sitting areas with pull out sofas. The Luxury Spa Suite is one of a kind and features a fireplace, jacuzzi, and a queen size poster bed with our signature down comforter. There is also an adjoining room with 2 twin beds, perfect for children. 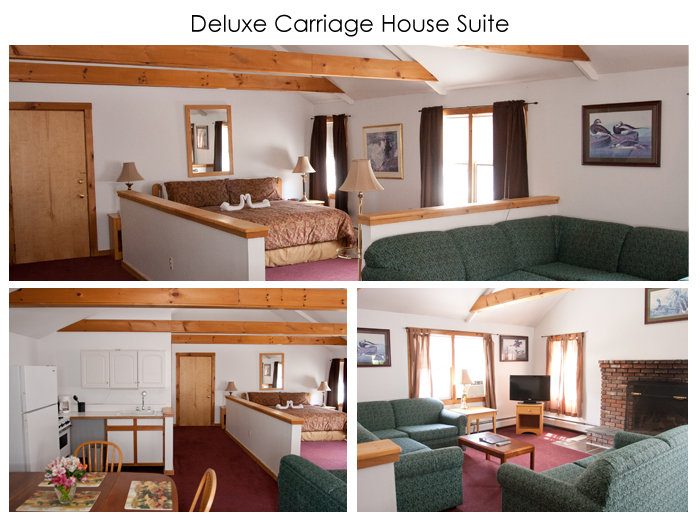 These are standard lodge style rooms, each have 2 double beds, private bath, and cable TV. Rooms are decorated with country quilts, and have armoires and some have pull out sofa beds. One Deluxe Country Lodge Suite available. This room offers a king size bed, a living area with two pull-up Sofa Beds, Spa Tub, Fire Place, TV, one bathroom and a Full Kitchen with appliances, all under vaulted ceilings. 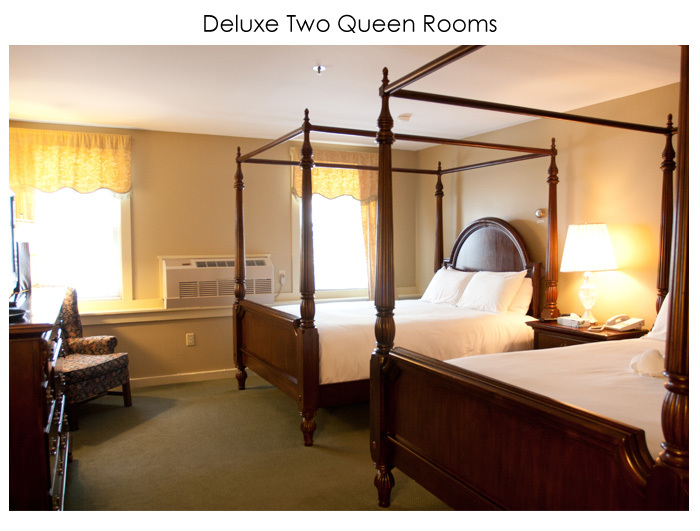 The Deluxe Country Lodge Suite also has an option of joining a standard carriage house room with 2 queen beds to expand the room space. Perfect for larger families. Fees for additional persons apply.